Traditionally, the term Patagonia had been associated only to the Argentine Republic, for the excellent promotion carried out by the country of its natural beauty and for the importance given to the region. However in recent years, the Chilean Government and Private Companies have also been strongly promoting the natural attractions of Patagonia Chile, so distant from the rest of the World. Patagonia, Chilean side, is the southernmost region of the Americas and is made up by the southern part of the Region de Los Lagos (Region of Lakes), Region of Aysen and Region of Magallanes, excluding the Chilean Antarctic Territory. Because of the wild geography of this part of the World, land connectivity through these regions is only via Argentine territory, however a regular airline and ferry service is always available. The sea voyage between Puerto Montt and Puerto Natales (or vice versa) is a very recommendable choice to get to know the stunning natural beauty of Patagonia through its channels and fjords, sailing near thick woods as well as glaciers and ice fields, still-living protagonists of the last Glacial Era. 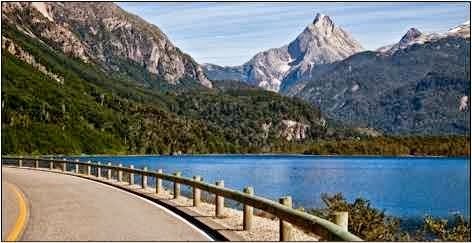 Another very recommendable way to explore the Region of Aysen, part of Patagonia, is through the Carretera Austral (Southern Highway) ranked one of the most beutiful roads all over the World, of more than 1,200 Km. long, mostly gravel, gorgeous views, from Puerto Montt to Villa O'Higgins town, gateway to the Southern Ice Fields. The landscapes are magnificent and, in many cases, in places never touched by human being as the population density is very low (it hardly reaches 1 inhabitant per Km2). 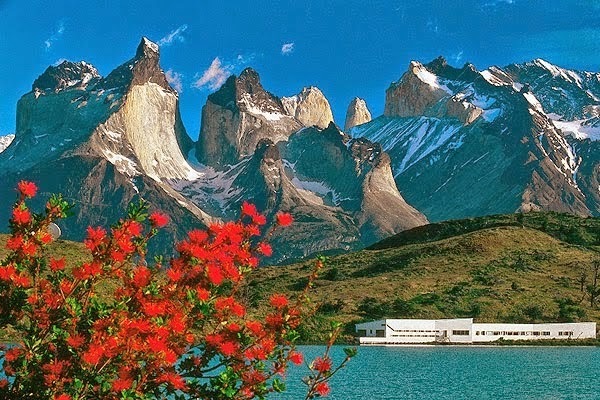 According to my own experience, living here for decades, the climate of Chilean Patagonia, as well as throughout the World, has undergone significant changes in recent years, the temperatures of the Sub-Antarctic area have risen approaching the temperatures that Northern Patagonia had decades ago. Anyway, I can say that, as a main feature, the Channels area has a rainy, moderately cold climate while in the inland the climate is usually drier with lower temperatures. The annual rain average in Punta Arenas is 440 mm. but in Evangelistas Island these can reach well over 2000 mm. In summer the weather is unstable and often can register all 4 seasons in one day. At this time the wind can easily exceed 120 km / hour, in the Avenues of Punta Arenas dozens of trees with twisted trunks are silent victims of its constant fury. Temperatures in the summer can rise to 18 ° C or a little more, but the microclimate of the area of Torres del Paine park enables these occasionally hover around 25 ° C. Between December 15 to January 15 in Sub- Antarctic Patagonia the daylight can last until about 23:00 Hrs. and a new dawn begins around 03:00 Hrs., looking in the distance to the south, it may be appreciated that the sky never darkens completely. The harshness from one winter to another can vary significantly, but the temperature in a normal day can go from about 0 ° C to 5 ° C. Until a few years ago, one of the main features of winter in Patagonia was the almost total absence of wind, which today has changed to a large extent since winds can easily reach 120 km/h or more in any month of the year. One of the major tourist attractions in Chile, 312 Km. North of Punta Arenas. Many tours are offered in the local tourist agencies to visit this gorgeous place, chosen "The Eighth Wonder of the World" by Virtualtourist.com, with more than five million votes throughout the World. The Park, created in 1959, covers an area of 242,242 Hs. and in 1978 was declared Biosphere World Reserve by the UNESCO. A chain of mountains of granite walls and snowcapped peaks, lakes of turquoise waters and rivers that come from the neighboring Southern Ice Fields make up –without a doubt-, one of the most beautiful views anywhere. Its great attractions and rugged geography make it one of the most sought after by lovers of ecology and adventure sports. The best time to visit Parque Nacional Torres del Paine is from November to March. It has a great implementation that provides security and ease to tour the Park. After a major forest fire occurred years ago, there is a very strict rule in the sense of not lighting fires in unauthorized places, the banning is informed in detail to visitors upon entering the park. Tierra del Fuego, by far the largest island of Chile, located in the South end of South America, is one of the most emerging tourist destinations in the country. Its territory is shared with Argentina, which, despite having the smallest part, has managed to take intelligent advantage of its natural attractions. It would suffice to name the city of Ushuaia or the Sport Fishing in Rio Grande and surroundings lakes. There are also many reasons to visit the Chilean side of Tierra del Fuego, although to visit those places located to the South of the town of Porvenir, it is recommended to do so only in the Spring and Summer seasons, due to the harsh climate. Tierra del Fuego is reached from Punta Arenas either by plane after a short flight or crossing the Strait of Magellan, which links the Pacific and Atlantic Oceans. Among the main attractions of Tierra del Fuego, Chilean side, can be mentioned its capital Porvenir, name that translated into English means "The Future", but whose constructions transport us to a past of pioneers who were mainly engaged in gold mining and livestock; Karukinka Natural Park, a Private Reserve run by the International NGO "Wildlife Conservation Society", home to many native species of plants and animals of the sub-Antarctic region; the practice of Sport Fishing in the South of the Island, highlighting World-class places such as Blanco and Deseado Lakes, Rivers Grande, Azopardo, Condor, and many others; Alberto de Agostini National Park, the third largest National Reserve, located at the southern end of the Region de Magallanes y Antartica Chilena. Here, apart from the Darwin Mountain Range, which forms its backbone, there is a gallery of beautiful glaciers that fall into the Beagle Channel, a dense sub-Antarctic vegetation and a rich fauna ranging from Albatrosses and Cormorants to Otters, Coypus, Sea Elephants and Whales. Season: December thru April. In the Strait of Magellan, 6 hours navigation from Punta Arenas, is located Parque Marino Francisco Coloane, a 67,000 Hs. protected area where can be observed Humpback Whales (Megaptera Novaeangliae), on a smaller scale the Minke Whale, Dolphins, Sea Lions, Penguins and other birds. Francisco Coloane Marine Park was the first area designated as a protected zone and marine park in the country. The ecosystem is complemented with the closeness of Santa Ines Glacier (which can also be visited depending on the program) and the natural environment with thick forests that reach the coastline. 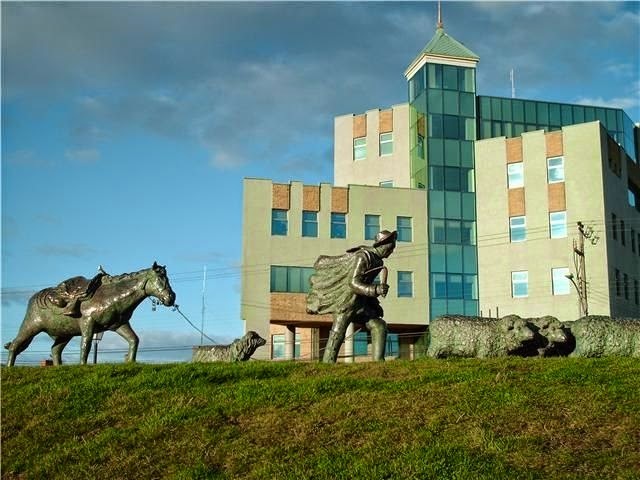 You can check for availability in the local tourist agencies of Punta Arenas, which is the home port. 62 Km. 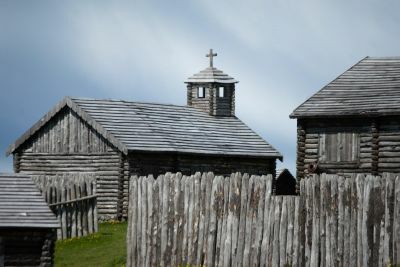 South of Punta Arenas, reconstruction of the first Chilean settlement on the Strait of Magellan in 1843, with a network of trails, lookouts and picnic areas. The tour includes a visit to several facilities such as the Chapel, the Jail, Cannon's Yard, stables, houses, dining rooms, etc. In 1848, the population moved from Punta Santa Ana, where the Fort was situated to a more favourable location giving rise to the current city of Punta Arenas. Near Fuerte Bulnes are located the ruins of Puerto del Hambre (Port Famine), Spanish colony that had a sad end. Puerto del Hambre is so called because of the tragic death of all its inhabitants, who first attempted to colonize the Strait of Magellan in 1584, founded the city Rey Don Felipe and later died from starvation in such an inhospitable place. On the shores of Cabo Froward (Cape Froward), Strait of Magellan, 48 naut/miles South of Punta Arenas. Situated at a height of 340 mts. on a cape that marks the end of mainland Chile and South America. The original cross was built in 1913, and then it was rebuilt several times due to unfavorable weather conditions. The current structure was erected to commemorate the visit of Pope John Paul II to the region in 1987. I must stress that Cabo Froward is the southernmost point of mainland Chile and South America. The English explorer and privateer Thomas Cavendish, in 1587, was who first named the Cape, because of the extremely hostile climate with high winds and heavy rains. Local tourist agencies offer Zodiac or Kayak trips to Cape Froward then carrying out the walk towards the Cross of the Seas. Inaugurated in 1904, it is located 75 Km. South of Punta Arenas, at the southern end of the Brunswick Peninsula, Region of Magallanes and Chilean Antarctic Territory. San Isidro was part of a chain of eight historic lighthouses on the shores of the Strait of Magellan. Currently, Faro San Isidro has been rebuilt and restored in order to become a lodging and tourist site.The surrounding landscape comprises dense native forests, the Strait of Magellan and tremendous panoramic views of Tierra del Fuego including the Darwin Mountains. 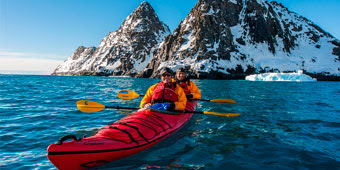 Among the activities to be carried out are Kayaking, visiting interesting places such as Cape Froward, the Southernmost point of mainland Chile and South America, hikes to Aguila Bay and Mount Tarn, once climbed by Charles Darwin. Located at 336 Bulnes Ave., next to Maria Auxiliadora "Don Bosco" Church, Punta Arenas downtown. Founded in 1893, today bears the name of its founder, one of the great missionaries among the Indians of Tierra del Fuego Island. "Maggiorino Borgatello" is one of the most comprehensive Museums in Chile with all the History, Ethnography, Biology, Fauna of the Patagonian territory. It has four exhibition levels covering the aboriginal life and their evangelization through the Salesian missions, flora and fauna, the beginning of commerce and industry, livestock, exploitation of oil, etc. The museum also has a valuable library with more than 4,000 books of the past and audiovisual material about regional history, ethnic groups that populated Patagonia as well as from the more recent past. This Salesian Museum is one of the most visited places by national and foreign tourists in Punta Arenas. 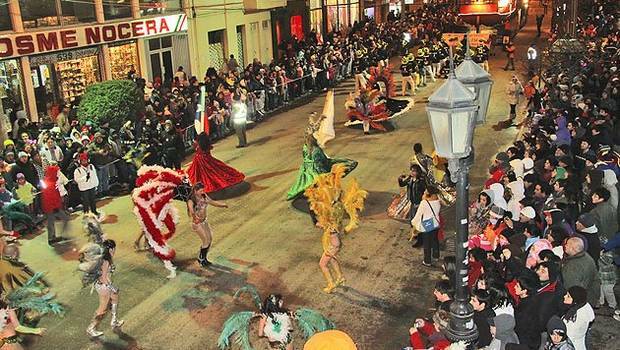 Named "Muñoz Gamero" in honour of a former Governor, one of the points of concentration of the many city tours that take place in the Patagonian capital during the summer, surrounded by buildings of attractive architecture, reflecting a time of economic splendor based mainly on livestock and exploitation of oil. One of them is the Union Club building, next to the Jose Nogueira Hotel. In the center of the square is the monument to the Portuguese explorer Ferdinand Magellan, discoverer of Chile by the South in 1520. The tradition says that the one who kisses the big toe of the Patagonian Indian at the foot of the monument, will return to this land some day. Located at 949 Magallanes Street, Punta Arenas downtown. Old mansion of pioneer family Braun- Menendez, in 1974 the residence was declared a National Historic Monument. The exhibit spans since the early geographical discoveries to the mid-twentieth century, including a complete collection of objects relating to the origins of Punta Arenas, collections of furniture and objects belonging to the golden age of the city and region through permanent exhibitions, since 2007 there are also temporary displays. Beautiful graveyard named "Sara Braun", one of the most visited places by tourists in Punta Arenas. In spite of a graveyard is not always the most attractive site for sightseeing, according to a survey by CNN in Spanish, this cemetery ranked sixth among the ten most beautiful in the world. Through the alleys with finely trimmed trees, its tombs and mausoleums evoke thousands of souls of common people, pioneers, victims of ancient shipwrecks or volunteers that went to give their lives during the World Wars from these distant lands. A "must stop" is the revered "Estatua del Indio Desconocido" (Statue of the Unknown Indian), surrounded by plaques of appreciation for favours received. 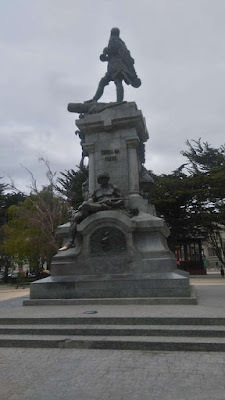 Located at Avenida de Bulnes, Punta Arenas, the "Monumento al Ovejero" is based on a real herdsman of the early twentieth century and inaugurated in 1944. The original version was made of granite, the current monument built in bronze dates from 1962, to pay tribute to people who for many decades have been devoted to what was the most important economic activity in the region, sheep livestock. This outdoor museum displays a series of machinery, carriages, tools, typical buildings of the pioneer period, a maritime section, a replica of an oil rig of the beginnings of the last century, a California Drilling Rig, circa 1900, the first to operate in the region. The Museo del Recuerdo is part of many of the city tours around Punta Arenas. Location: Km. 3.5 of Bulnes Ave., in front of Punta Arenas' Duty Free Zone. In Avenida Costanera (Waterfront Ave.) in front of Arturo Prat pier. On the first floor are the stalls selling seafood as well as handicrafts. On the second floor there are several "cocinerías" (kitchens with small restaurants), all very clean and tidy, where you can taste many delicacies like the exquisite "centolla" (King Crab), different kinds of fish and shellfish. There are also souvenir shops. On the top floor there is a larger and comfortable restaurant, the "Vistamar", with an excellent view of the Waterfront and bay. Punta Arenas' Municipal Market is a place not to be missed when visiting this city, although the prices are not cheap, a dish of King Crab can cost $ 9000 (about US$ 12.5). Adjacent to the Market there is a large handicrafts center. 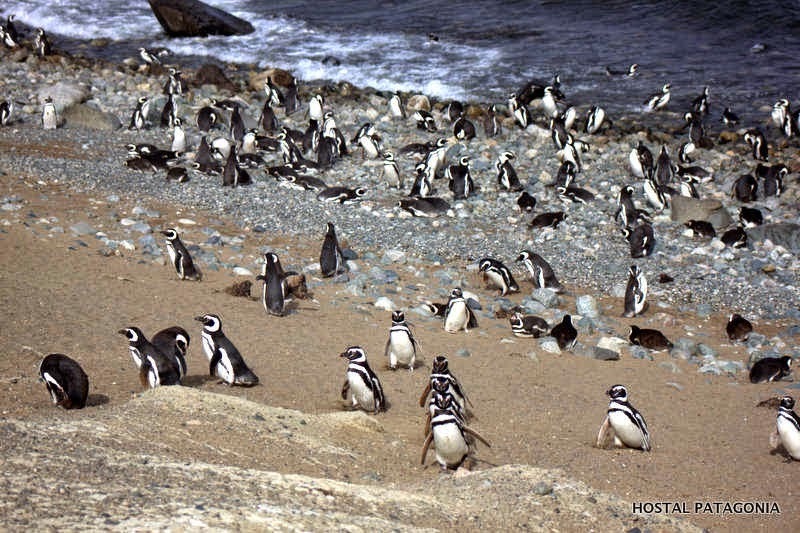 Sanctuary of Nature, the "Monumento Natural Los Pinguinos" is made up by Marta and Magdalena Islands. 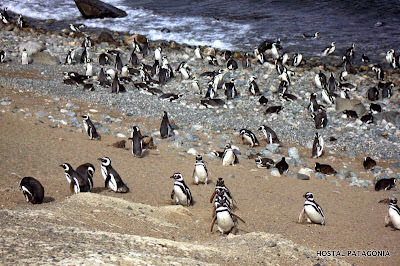 25 nautical miles of Punta Arenas, also natural refuge for other species such as Sea Lions, Cormorants, Antarctic Gulls, and other mammals and aquatic birds. Throughout the season (October 15 to April 15) there are permanent boat trips departing from Punta Arenas and outskirts to admire the population of more than 120,000 specimens. 7.5 Km. N. of Punta Arenas. It is an interactive museum with replicas of ships, weapons and objects from old times which have had historical importance for the life of the region. There is a full scale reproduction of the "Nao Victoria", ship used by the Portuguese navigator Fernando de Magalhaes (Ferdinand Magellan), discoverer of these lands and the first to circumnavigate the Earth between 1519 and 1522, under the reign of King Carlos I of Spain. There is also the reproduction of the "James Caird", and adapted lifeboat which had an outstanding participation in the rescue of the British Antarctic Expedition of Sir Ernest Shackleton, whose ship the "Endurance" sank in the Antarctic Ocean in 1916. Another replica is the "Goleta Ancud" (Schooner Ancud), first warship built in Chile that setting sail from Chiloe Island, took possession of the Strait of Magellan on behalf of the Chilean Government in 1843. Very soon will also be available the replica of the famous brig "HMS Beagle" belonging to the British Royal Navy, in whose second voyage (1831-1836) the renowned English naturalist Charles Darwin took part in the scientific expedition performing his famous studies and theories. One of the countries that Darwin studied thoroughly was Chile and especially, Patagonia. Also known as "El Escorial del Diablo" (The Devil's Slag Pile). Located 200 Km. NE of Punta Arenas, near Punta Dungenes, the easternmost point of Chile. Its main attraction is the "Cueva de Pali Aike" (Cave of Pali Aike), declared a National Historic Monument, where evidences of human life of 11,000 years ago have been found. The park is accessible from the International Route No. 255, going 28 kms from Punta Delgada village. With respect to fauna of this desolate corner of the pampas, you can see Guanacos, Gray Foxes, Skunks or even the Patagonian Puma. Among birds, the Carancho, Cernicalo (Kestrel) and Queltehue. Of the few species of flora due to the dryness of the land, can be observed the Calafate (typical small fruit of the region) Murtilla, Mata Negra, Mata Gris, Romerillo. Because of the presence of numerous low rise craters, natural caves, lava fields and arid terrain at times the Park gives the appearance of being in a lunar landscape. Tours are available from the city of Punta Arenas, which usually include " Estancia San Gregorio" (San Gregorio Cattle Ranch), founded in 1876, today a place almost forgotten but which pioneered sheep breeding in Patagonia. Without a doubt, the biggest mass gathering event that the city can offer, traditional since 1996. The arrival of Winter is celebrated every June 21th when the "Year's Longest Night" is commemorated and concludes at the end of July when the Winter Carnival attracts about 50,000 enthusiastic participants and spectators who don't heed the harshness of the season. 3 hours sea voyage leaving from Puerto Natales. Beautiful seascapes, marine and bird fauna during the travel until reaching the north extreme of Ultima Esperanza Fjord. From the East side of Monte Balmaceda of 2,035 mts., hangs Glaciar Balmaceda and by the North, Glaciar Serrano. 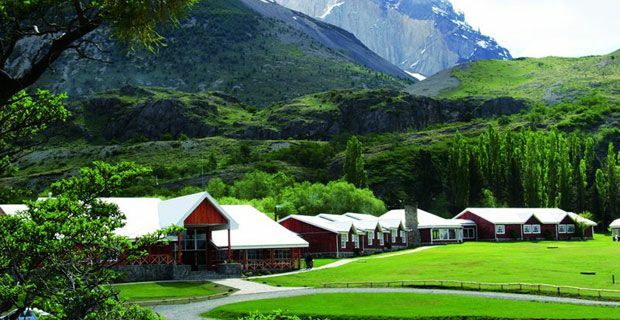 From the nearby inns are also scheduled excursions on foot, horseback, kayak or inflatable boats to different places like Glaciers Felicia, Tyndall, Geyke, Chacabuco, Lago Azul and the wonderful navigation through Serrano River. Name in commemoration of the Salesian priest, ethnographer, explorer and photographer of early the XXth century. With a surface area of 1,460,000 Hs. Alberto de Agostini is Chile's third largest National Park. An almost uninhabited zone, in Isla Tierra del Fuego (Land of Fire Island), 80 nautical miles South of Punta Arenas reaching the Beagle Channel, where thick forests grow up at the foot of snowed mountains and the glaciers fall into remote inlets. With this setting as a backdrop, highlights the Darwin Mountain Range, studied in depth by Charles Darwin in the XIXth century, too little explored until now. Currently, there is a road infrastructure that is being built by the "Cuerpo Militar del Trabajo" of the Chilean Army, but can also be carried out 4 X 4 excursions, horse ridings, kayak trips or a spectacular sea voyage leaving from the port of Punta Arenas. Among the innumerable sights stand out the imposing glaciers Marinelli, the largest in Alberto de Agostini National Park, De Agostini, Glaciar Pia, Garibaldi, Gunter Plushow, Romanche, Brookes and others. Wildlife includes Condors, Otters, Coypus, Albatrosses, Cormorants, Sea ​​Lions, Dolphins, the Guanaco, a typical animal of this part of the World, etc. 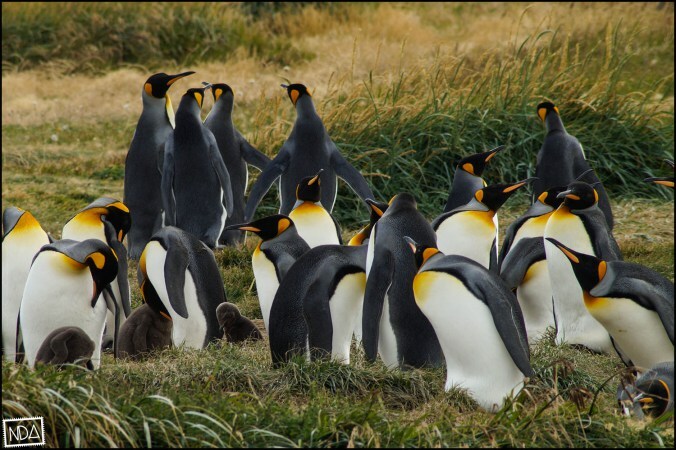 *DAP Antartica (Tourist Programs for Antarctica & Patagonia). Commune of Futaleufu, bordering Argentina. Located 1,300 km. South of Santiago, it is a charming tourist destination, of fertile land and snowy peaks belonging to the Southern Andes. All South Chile has something special but this commune has attractions that captivate tourists. It is crossed by the wonderful Rio Futaleufu, born in Los Alerces National Park, Argentina, until its turbulent waters empty into Lago Yelcho, Chile. 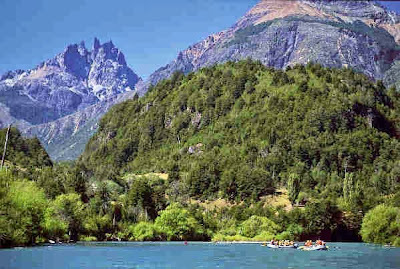 Futaleufu is one of the most important rivers in the world for practicing Rafting and Kayaking. Furthermore, the entire area is very suitable for the practice of recreational fishing, we could say it's like a Fly Fishing Paradise, a variety of programs are organized in the Rio Futaleufu, Rio Espolon (one of its tributaries), Lago Lonconao, Lago Espolon and others. This is only an introduction to this commune of ordinary people with incredible natural landscapes, where you can also enjoy a tasty cuisine and where visitors are welcomed with open arms. With 1,742,000 hectares of extension, Parque Nacional San Rafael was declared a World Biosphere Reserve by UNESCO in 1978. There are sea voyages to Glaciar San Rafael, wonderful place of more than 15 Km. long, 2 Km. front and ice walls over 70 meters high, located 82 Km. S. of Puerto Chacabuco, Region of Aysen. The navigation route to reach San Rafael runs parallel to the Northern Ice Fields. Something that always impresses visitors are the sudden roars produced by the constant avalanches of large masses of ice into the sea, this ice dates back more than 300,000 years old. Within the Park boundaries is also located the highest mountain of the Chilean Patagonia, Monte San Valentin, with 4058 mts. elevation, at the extreme North of the Northern Ice Fields, this mountain is also called on some maps Monte San Clemente. In spite of the remote location of Monte San Valentin, there are specialized companies that carry out expeditions, since the area is of exceptional beauty. In general, the climb is not of a great technical difficulty but in some stretches requires a good level of knowledge. Besides the climatic conditions may be adverse for several days. Route 7, better known as Carretera Austral, runs from Puerto Montt in the Region de Los Lagos (Region of Lakes) to Villa O'Higgins in the Region of Aysen. Currently, it has a lenght of just over 1,200 Kms., being a road that is in constant expansion since in the future it is projected to reach Puerto Williams, capital of the Antarctic Province in the far south of the country. Due to the difficult geography of the territory, some stretches must be made via ferry. The road passes through idyllic landscapes, so this mostly gravel road has become a true pole of attraction for national and international travelers either with motor vehicles or bicycles. To tour the Carretera Austral is necessary to go prepared with rations, proper clothing and equipment to deal with adverse weather conditions that may arise. Thanks to this road, -one of the most ambitious connectivity projects undertaken by the Chilean Government due to the wild geography of the territory-, access to many attractions of Northern Patagonia has become much more expeditious. Thus, you can reach the beautiful cove of Puyuhuapi and its surroundings including the nearby Queulat National Park, not without first visiting the fascinating Pumalin Private Park in the Province of Palena, with its variety of activities offered to tourists or the commune of Futaleufu, highlighting the Rio Futaleufu, known worldwide for its unique conditions for the practice of rafting and kayaking. Another major attraction in Chilean Patagonia is Lago General Carrera (General Carrera Lake), shared with Argentina where it is called Lago Buenos Aires. Here, in the largest lake of Chile and the fourth largest in South America, you can visit the amazing mineral formations of calcium carbonate known as Marble Cathedrals. The route also crosses Reserva Nacional Cerro Castillo, a National Reserve with many natural attractions, where is located Cerro Castillo, one of the most beautiful and characteristic mountainous chains of Patagonia. Arriving at the southern part of the Aysen Region you will find Rio Baker (Baker River), Chile's mightiest water course, highly sought destination for sport fishermen, also famous among those who practice extreme Rafting, there is a large range of tours, fishing lodges and related services that are offered. The scenery is sublime, with waterfalls and a hanging glacier, deep cliffs, thick forests, lakes and rivers. 165 Km. N. of Coyhaique, Region of Aysen. Due to its very rugged geography, this park is one of the least intervened areas of the country, this fact makes it a region of great tourist potential. 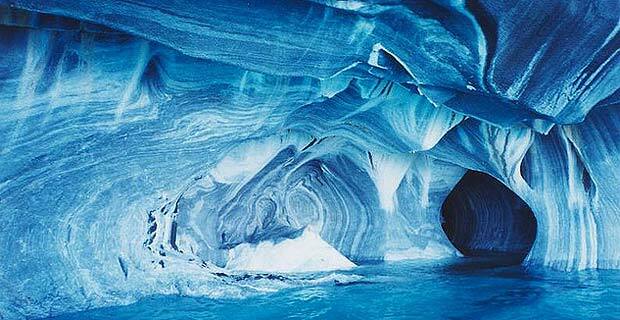 The hanging glacier, was discovered in 1875 by Captain Enrique Simpson. According to his description, the glacier reached 100 meters from the sea but it is currently at a distance of 7,800 meters from the coastline. Chile's largest Private Natural Reserve, with more than 325,000 hectares and a length of 85 Kms., world- renowned because of the incomparable beauty of its landscapes. One of the last places on Earth almost untouched by human hand, declared a Nature Sanctuary by the Government of Chile in 2005. Open all year round, areas for camping with facilities for tourists. Palena Province, Xth. "Region de Los Lagos" (Region of Lakes). There is a wide range of activities that can be performed especially those related to adventure tourism, a variety of trails for different levels of experience that lead to amazing places even through thick forests and volcanoes, a large number of granite walls and peaks for climbers, sea kayaking and observation of wildlife in their natural habitat such as dolphins, sea lions and whales, bikers are also welcome to ride the Park through the bike trails. Navigation through Lake General Carrera, visiting this strange but extraordinary series of caves, carved in marble by nature itself. Next to the Marble Cathedral, there are also other rock formations known as the Marble Chapel and Marble Cave. When the water level is low you can go inside the caverns. 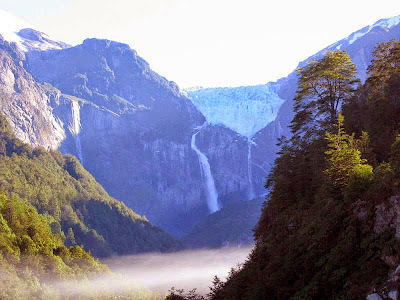 The most visited Nature Sanctuary in the Region of Aysen. Access by sea, amidst lush greenery, on the shores of Bahia Dorita, about 30 minutes navigation from the village of Puyuhuapi, commune of Cisnes, Region of Aysen. Both in winter as in summer a spectacular setting, nature at its best. 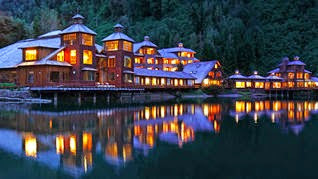 The cozy hotel has pools with thermal waters at different temperatures, there is also a wide variety of activities that can be performed with specialized guides: excursions to explore this part of Patagonia such as the charming Queulat National Park, crossing the fjord by boat to the pier on the Carretera Austral, then travel a stretch of 15 minutes by car to the area of the hanging Glacier; you can also sail with kayak or motorboat through the quiet channels and islands contemplating the rich marine and bird life; of course you may also enjoy recreational fishing in the generous southern rivers and lakes, or take one of the many tours offered by agencies operating in the region. Due to the number of natural attractions in the whole area, the remote town of Puyuhuapi and surroundings have also many other hotels, campsites and lodgings, some of them run by their own owners in private houses. 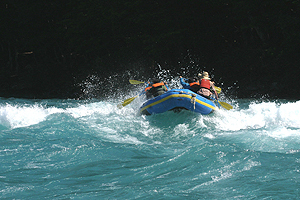 In the numerous rapids of the Aysen Region, especially of Rio Baker, which rises at the southern end of Bertrand Lake, southwest of Lake General Carrera; Rio Simpson, also favorite spot for fly fishing and other water sports activities; Rio Figueroa, 30 km from La Junta, en route to Lago Verde; rivers Blanco and Aysen which make up another of the ideal routes for rafting and the worlwide famous Futaleufu River in Northern Patagonia. Various fishing excursions are available in the local tourist agencies. In the Patagonian regions of Aysen and Magallanes can be found world-class rivers and lakes for the practice of Sport Fishing. In Aysen: Rio Baker, Rio Simpson, Rio Aysen, Lago Los Palos, Lago Riesco, Lago Elizalde, Lago Azul, Rio Azul. In Magallanes Region: Laguna Parrillar, Rio San Juan, Rio Grande (Isla Riesco), Rio Grande (Isla Tierra del Fuego), Lago Deseado (Isla Tierra del Fuego), Rio Condor (Isla Tierra del Fuego), Lago Blanco (Isla Tierra del Fuego), Rio Azopardo (Isla Tierra del Fuego), Rio Tranquilo (Puerto Natales), Rio Hollenberg (Puerto Natales), Rio Serrano (Torres del Paine), Lago Toro (Torres del Paine), Rio Vizcachas (Torres del Paine). Fishing License is required, granted by the governmental entity "Sernapesca", Patagonia Chile. What is the origin of the name Patagonia?